If you’ve been partner dancing for some time now, it’s likely you’ve danced with a multitude of different partners. It’s even more likely that you didn’t quite love every one you’ve had, either. In the world of dance, there are some things that everyone knows you just shouldn’t do when you’re dancing with a partner. Whether it be for courtesy reasons or just common practice, it never fails that we will experience at least one of these dance partner taboos. Bad breath, body odor, you name it. When someone has poor hygiene, it’s pretty obvious, especially in the close range necessary when you’re dancing together. While this one is easily preventable, it is also a deal breaker when it comes to a second dance with your partner. Prevent any offensive odors by keeping a few materials on hand like an extra stick of deodorant in your bag or a few breath mints in your pocket. It can never hurt to take precautions to avoid this potentially uncomfortable scenario! While you can definitely have some fun with your dancing outfits, too much of a good thing is sure to backfire. 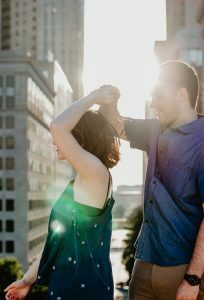 Accessories like dangly necklaces, clunky watches, or sharp rings are all major hazards to your partner when you’re dancing at a quick pace. Think about the last time you’ve gotten clipped by a piece of jewelry- not a good feeling is it! Avoid this altogether and instead opt for simple, small pieces during your dance or even go completely jewelry-free. As for outfits, take care when choosing your garments to make sure they are not too big and flowy. While large garments may not be as dangerous as sharp jewelry, it can definitely make for some pretty embarrassing moments on the dance floor should your partner accidentally tangle themselves in your outfit! Man or woman, this one is a big no-no. Latching on to your partner’s hands with an iron grip will not only make them uncomfortable, it will make it difficult to perform the dance at all. Learn to control your balance and movement on your own to spare them injury and make the dance flow much more naturally. Whether it’s adding in unnecessary moves or forcing dips and spins, it’s never fun when your partner hijacks the dance. Not only can this lead to injury due to your partner not expecting it, it makes the movements feel forced and like you’re being controlled. Part of the fun of dancing is playing off of your partner’s energy, and hijacking almost completely eliminates the teamwork that goes into partner dancing. Make sure to pay attention to your partner’s leads and cues when you’re dancing to avoid being hijacked and to avoid being the hijacker! 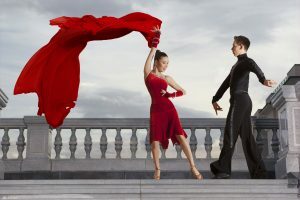 While there are certainly more dance taboos out there, theses are some of the main ones that will virtually guarantee you and your partner will not have a good experience. If you think you have ever been guilty of any of them, take some time to assess your skills and even ask past partner’s for advice on how to avoid them in the future!